First magnetic drum memory, a magnetic data storage device and an early form of computer memory, which plays an important role in the computer memory development (e.g. 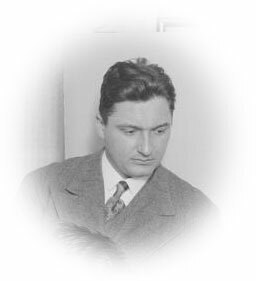 used in ABC computer) and was widely used in the 1950s and into the 1960s, was invented by the Austrian engineer Gustav Tauschek (1899-1945) in 1932 in Austria. Tauschek was a genius self-taught Viennese engineer, who besides the drum-memory, invented also many devices and systems for the punch-card machinery, as well as the first OCR (Optical Character Recognition) machine in 1928 (see the US patent 2026329), so called Reading Machine. During the years 1926–1930 Tauschek worked for Rheinmetall in Sömmerda, Germany, where he developed a complete punched card-based accounting system, which however was never mass-produced. In the spring of 1928, Rheinmetall created a subsidiary company that was assigned to develop new punched card-based machines. In the fall of the same year, the subsidiary was bought by IBM, thereby assuring its monopoly on the market. Tauschek was awarded a five-year contract and sold 169 patents to IBM in his life-time. 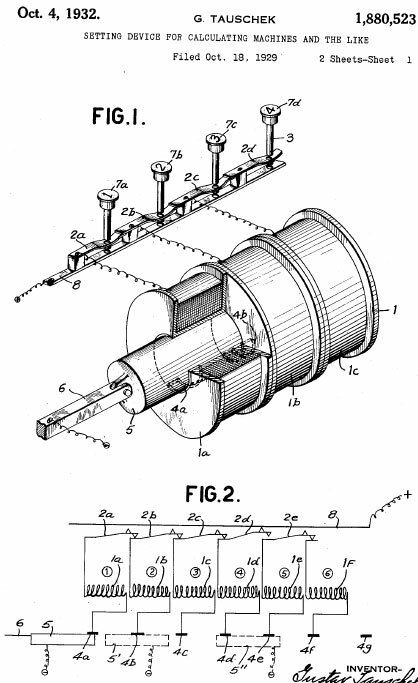 In 1932 Tauschek obtained a US patent for his magnetic drum device (see US patent 1880523 and the lower patent drawing). In its most basic form, magnetic drum memory is simply a metal drum or cylinder, coated with a ferromagnetic recording material. Stationary write heads emit an electrical pulse, changing the magnetic orientation of a particle at a given position on the drum. The read heads, which are also stationary, recognize a particle’s orientation as either a binary 1 or 0. 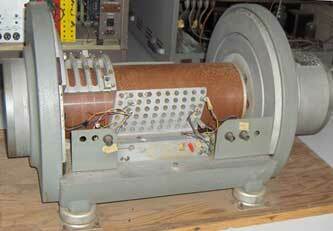 Tauschek’s prototype could store 500000 bits across the drum’s total surface for a capacity of about 62.5 KB. The principal difference between a drum as described and a modern disk is that on a drum the heads do not have to move to the track to access, as the controller simply waits for the data to appear under the relevant head as the drum turns. In a disk drive the head takes a certain time, the seek time, to move into place, while the performance of a drum with fixed heads is determined almost entirely by the rotational speed. As late as 1980, the PDP-11/45 machines that used drums for swapping were still in use at many of the original UNIX sites. In modern-day BSD Unix and its descendants, /dev/drum is the name of the default swap device, deriving from the use of drum secondary-storage devices as backing store for pages in virtual memory.